Sketch G Showing the Progress of the Survey in part of Section VII from 1849 to 1871. An uncommon example of the 1871 U.S. Coast Survey progress and triangulation chart or map of the Gulf coast of northern Florida from Pensacola to the Cedar Keys, including St. Georges Sound. 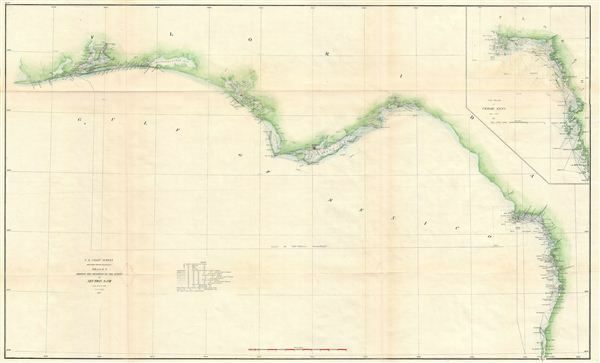 Progress maps of this sort were made to illustrate work of the survey and accompanied the Superintendent of the Survey's annual report to Congress. The survey began work in this region in 1848. Work progressed slowly though the 1850s and ground to a halt altogether in the early 1860s due to the events of the American Civil War. Following the Civil War Coast Survey work began again in earnest and continued well into the 1870s. This chart was compiled under the direction of Coast Survey superintendent Benjamin Pierce for issue in the 1871 annual report to Congress. Pierce, B., Report of the Superintendent of the United States Coast Survey, (Washington) 1871.